Technological advances have improved every aspect of our everyday lives. Virtually everything can be controlled through your smart phone or a button and your window tinting can be too. Smart window film is the latest innovation in window tinting that allows for privacy and flexibility with ease. The film is applied to a window that has an electric current and is then linked to your smart phone or a switch, putting the power right in your hand. Previous versions of window film were very sensitive to moisture and could only be applied to windows permanently by laminating the desired glass with UV window laminate. Today smart window film is more moisture resistant and accessible to most windows. The film is installed on windows with a self-adhesive glue and is then connected to an electric output that operates the smart film and allows you to turn it from opaque to clear with the flip of a switch, click of a button, or even the clap of your hands. Smart window film is a practical way to save space in small offices or in your home. When dimmed, it can serve a number of purposes. Your windows can now be used as a projector or a white board, making homework more interactive or your boardroom a lot more tech savvy. Previously opaque tint was applied to windows to provide privacy, but they could not be adjusted. When dimmed, smart window film will turn opaque or tinted. This decreases visibility into a room and creates privacy when you need it and transparency when you do not. This is ideal for boardrooms or shared offices where different spaces serve different purposes on a daily basis. Bulky blinds are becoming a thing of the past as smart window film now makes it possible to turn a room’s windows from clear to opaque at the switch of a button. With minimalism being on trend, smart window film is an ideal way to change the feel of a room without fitting the bill for new blinds or fabric curtains. It can keep your space well lit, while appearing less cluttered – keeping your home and office stylish. When installed to all the windows in a building, smart window film can make the building climate adaptive. This can drastically reduce your lighting, heating and air-conditioning bills as there will be less need for temperature control appliances. Great news! 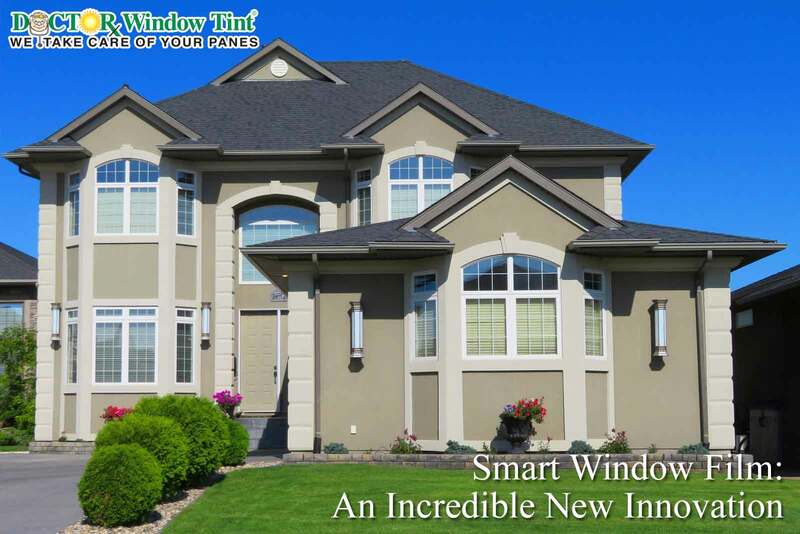 When it comes to the installation of your smart window film, you won’t have to leave the comfort of your home or office, because Doctor Window Tint in South Florida offers onsite window tinting and will come to you. Our installation team are experts in their field and are on call to meet your window installation needs. Smart window film is adaptive and can be applied to almost any window with sufficient electric current. Contact us today to find out if smart window film can be installed on your home, office or car’s windows.